You can purchase the complete Kids' Wings 27-page Unit for The Perfect Wizard by Jane Yolen and The Uglified Ducky by Willy Claflin NOW! Available for immediate download for only $17.95! Sharable within your school! Click Here to purchase and download from Teachers Pay Teachers. "The Ugly Duckling" comes to the moose world in this hysterical story told in "The Uglified Ducky" in book and on the CD inside! Storytelling doesn't get more fun than this and the proof is that kids and adults alike are stampeding to read and listen over and over to Mayanard Moose tell his endearing story in his moosey dialect! Illustrations by James Stimson provide the perfect comic background for the story of a baby moose who is found by Mommy Ducky. "Ooo, Look at that! That is a uglified ducky!" As a companion book, you must have The Perfect Wizard by Jane Yolen. Now you can read the biography of Hans Christian Andersen who wrote the original story of "The Ugly Duckling" in a beautiful picture book by Jane Yolen. At the bottom of each page, you can see a snapshot of one of his stories, inspired by his childhood and his struggles. Read about his determination to gain fame and the long road to his genius being discovered. His fairy tales have lived happily ever after in the hearts of children and kings for hundreds of years. He was The Perfect Wizard. Practice reading more stories in fractured English! Great phonics practice! An activity guide for The Uglified Ducky by Willie Claflin is combined with our unit for The Perfect Wizard by Jane Yolen to provide mastery-perfect lesson planning and handouts for projection on your SmartBoard is now available! Willie Claflin's delightful story telling on CD in the book! Six-Page Readers’ Theater Script for the traditional "Ugly Duckling"
The Uglified Ducky is included in the Kids Wings Tempests and Teamwork Collection of literature guides for award-winning novels and intermediate-level picture books. Our Tempests and Teamwork package includes a site license for one school, a spiral bound book, and CD containing 29 titles with over 700 pages of activities, nine "Jeopardy-type" games, Karoke-type songs, and professionally recorded songs! 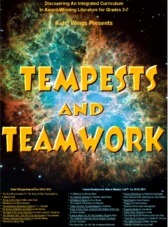 You can purchase a literature guide individually for around $12.95, but if you order Tempests and Teamwork, you can get 29 literature guides for only $20, or less than $1 each! This is probably the greatest bargain in the USA, as long as quantities last! Pizzicato Polka 1, by Franz Peter Schubert is our background music.